Just about everything can be bought online. These days, when it is time to order business checks this too can be done via the Internet. This method is popular for many reasons. Normally a set of business checks is provided when a new account is opened. These can be used in the initial stage, but there is no need to keep buying them from the bank. Customers have plenty of time to source and order checks online. Many companies now order online because it is generally a cheaper option. It is also a lot more convenient as orders can be made at anytime. Add to these benefits the fact that it is much faster and this explains the growing trend. * Find out which printing companies your bank or other financial institution takes checks from. Not every check printing company's products are acceptable to all banks. Verifying this beforehand will save time and possibly money. * Decide on the design and color you would like. This is a good time to also consider the types of documents that will be needed. * Open a checking account if the business is new. The financial institution will provide information on the requirements for doing this. Once the design and other details are taken care of, it is time to complete the purchase. To do so it is necessary to have the company's credit card or PayPal information on hand to pay for your order. There are websites online that help make the process easier. Some of these sites compare different check printing companies. This allows buyers with just a glance to see prices and the types of business checks being sold. Interestingly, business checks can even be printed by the company using them. Once first-rate paper and a good printer are used, the quality is not compromised. This method is gaining popularity among many companies. When a company prints its own checks they no longer have to worry about delivery. Buying paper and ink for the printer is a much easier and cheaper option. It is highly unlikely that there will be no supply of these commodities. Since these financial instruments are a representation of your company, make wise choices. The design and quality paper can be used to judge the company. Despite the abundance of designs available, it is best to use designs that represent your brand. * A professional look that is indicative of what your brand is all about. * Include security features such as watermarks to prevent easy duplication. The paper used should ideally be such that the color of the check will change once certain types of changes are made. This minimizes the risk of fraud. * They must meet the specifications of financial institutions. * They should be easily printed from the company's printer if this is the route chosen. Ordering business checks online is a simple process. Once security guidelines are followed, it's as easy as one, two, three. 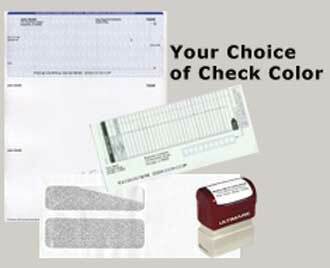 The Cheap Check Store Tean are experts on custom printing services and how to order cheap checks and business checks.